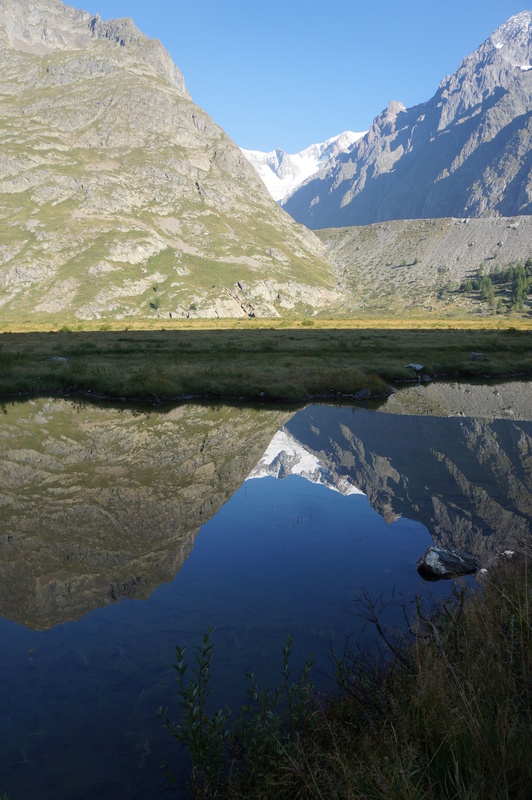 I was surprised at how few lakes we did see on our hiking adventure of the Tour du Mont Blanc. There seemed to be water everywhere with streams running with lots of water many times requiring us to hike right through them. But lakes, there were not as many as you’d think. This particular morning, though, the trail went right along this beauty. The air was so still that the surface of the water made for the most perfect reflection of the crystalline clear ultramarine sky. Wow. Here we have mountains, snow, sky and water more perfect in the reflection so I moved the land line up to showcase it. This is one time the word awesome is an actual good description!